40G network are now being extensively adopted within LANs and data centers. 100G is still predominantly in the carrier network, but could soon extend its stretch to your local network. There exists much confusion as to whether to choose single-mode fiber (SMF) or multimode fiber (MMF) for deploying 40G bandwidth, considering the single mode vs multimode fiber cost. As well as how to get fully prepared for scaling to higher-speed 100G. If you are hesitating to make the choice, you may find this article helpful. Cost-effectiveness: Multimode fiber (MMF) has been evolving to handle the escalating speed: OM3 has been superseded by OM4 and OM5 is there ready to use. MMF has a wider array of short distance transceivers that are easier to get. One of the liable argument that in favor of using MMF is that multimode optics use less power than single-mode ones, but only in condition that you have tens of thousands of racks. In essence, MMF still has its position under certain circumstances, like cabling within the same rack, in Fiber Channel and for backbone cabling in some new construction buildings. Tolerance to Dirt: Multimode fiber tends to have a lot more tolerance to dirty connections than single-mode fiber. It can handle very dirty couples or connectors to ensure reliable and consistent link performance. Besides, it is easy to terminate, and more accommodating bend radius. So MMF is preferred by links that change frequently or are less than permanent. 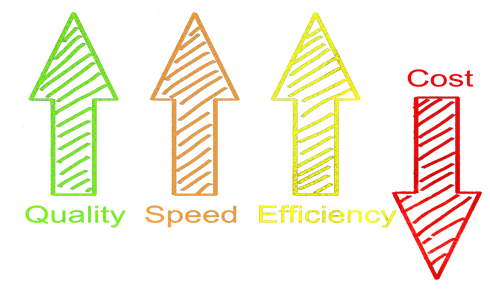 Speed capability: Capacities are really vital for network growth. SMF does so with relatively larger capability than that of MMF. The gap between SMF and MMF cabling is much wider for high-density, high-speed networks. If you want to go further with SMF, say scaling to 100G or beyond, you simply need to upgrade the optics. Unlike using MMF, in which you have to upgrade the glass (OM3 to OM4 to OM5), the labor cost concerning this cannot be underestimated. The capacity for scaling of SMF alone makes it worth the cost. You can use single-mode for almost everything, no need for media conversion. SMF offers enough bandwidth to last a long time, making it possible to upgrade 100 Gbps to Tbps with CWDM/DWDM. Future proofing: Despite the fact that SM optical transceivers usually cost higher than MM optics, SMF cabling is cheaper and can support much longer distance and reliable performance. Not to mention that bandwidth on SMF keeps going up and up on the same old glass. The good news is that the cost of SMF is dropping in recent years, and it is redesigning to run with less power, thus advocators of SMF think that it is pretty much the only rational choice for infrastructure cabling and the sure winner for today and tomorrow. There is no doubt that SMF is a better investment in the long run, but MMF still has a long way to go in data center interconnections. In fact the price difference of SMF optics and MMF optics can be minimized if you choose the right solution. 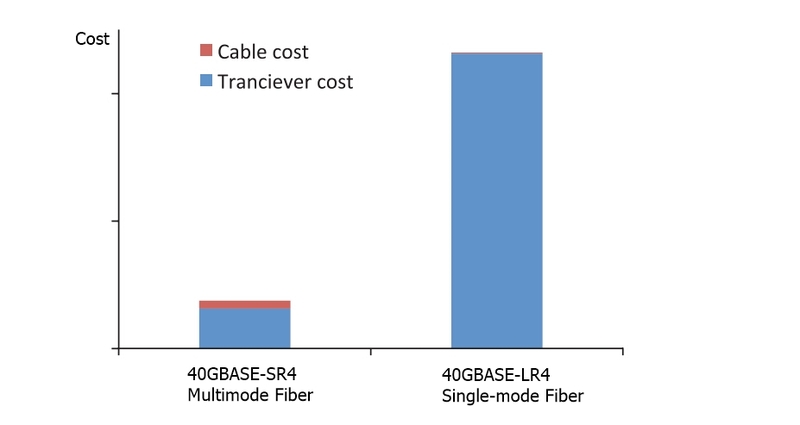 Assuming to connect two 40G devices at 70 m away, let’s see the single mode vs multimode fiber cost for deployment in the following chart. Choosing the right fiber for your network application is a critical decision. Understanding your system requirements in order to select the appropriate fiber will maximize the value and performance of your cabling system. Be sure to select the right cable on the basis of aspects including link length, performance, and of course costs. FS provides a broad range of 40G optical transceivers and fiber patch cables with superior quality and fair price. For more details, please visit www.fs.com. Related Article: Single Mode vs Multimode Fiber: What’s the Difference? This entry was posted in Fiber Optic Transceivers, Multi Mode Fiber (MMF), QSFP+ Transceiver, Single Mode Fiber (SMF) and tagged 40G optical transceiver, MMF, Multimode Fiber, single-mode fiber, SMF, smf mmf on August 19, 2017 by Aria Zhu. How to Convert a Port From QSFP+ to SFP+? As data communications technology migrates from 10GbE to 40GbE and beyond, it is often necessary to connect 40GbE equipment with existing 10GbE equipment. As we know 40GbE NIC or switch usually equipped with QSFP+ ports, and 10GbE switch usually equipped with SFP+ ports. That is to say we must know how to convert a QSFP+ port to a SFP+ port. At present, there exists three ways to solve this problem. I will explain it in this blog. As shown in the figure below, a QSFP+ to SFP+ cable consists of a QSFP+ transceiver on one end and four SFP+ transceivers on the other end. The QSFP+ transceiver connects directly into the QSFP+ access port on the switch. The cables use high-performance integrated duplex serial data links for bidirectional communication on four links simultaneously. The SFP+ links are designed for data rates up to 10 Gbps each. QSFP+ cable is available in passive and active two types. Passive QSFP+ cable has no signal amplification built into the cable assembly, therefore, their transmission distance is usually shorter than an active one. You can convert a QSFP+ port to a SFP+ port using the QSFP+ to SFP+ adapter. QSA provides smooth connectivity between devices that use 40G QSFP+ ports and 10G SFP+ ports. Using this adapter, you can effectively use a QSFP+ module to connect to a lower-end switch or server that uses a SFP+ based module. This adapter is very easy to use. As shown in the figure below, just plug one side of the QSA in your QSFP+ port, and plug a SFP+ module into another side of the QSA. Then you can convert a QSFP+ port to a SFP+ port easily. As we know, parallel 40GBASE-SR4 QSFP+ modules use 8 out of 12 MPO/MTP interface fibers transmitting 4 x duplex (DX) channels (4 x transmit and 4 x receive). The QSFP+ breakout cable uses a pinless MTP connector on one end for interfacing with the QSFP port on the switch. The other end contains 4 duplex LC connectors, which provide connectivity to the SFP+ ports on the switch. Thus higher-speed equipment (40G QSFP+) can be connected to slower-speed equipment (10G SFP+) successfully. 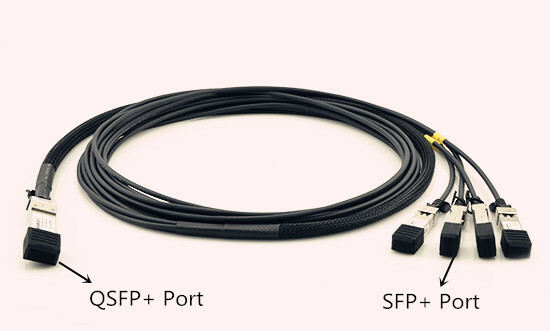 When you want to connect a QSFP+ port to a SFP+ port, you can use QSFP+ to SFP+ cable, QSFP+ to SFP+ adapter or QSFP+ breakout cable. All these three options can meet your needs. FS.COM provides a full range of compatible QSFP+ cable, which can be 100% compatible with your Cisco, Juniper, Arista and Brocade switches and routers. Or you want to use QSFP+ breakout cable, you can also find it in our Fiberstore. This entry was posted in QSFP+ Transceiver, SFP+ Transceiver and tagged QSA, QSFP+, QSFP+ breakout cable, QSFP+ cable, QSFP+ to SFP+, QSFP+ to SFP+ Cable on January 18, 2017 by Alice.Gui. Do You Know about Active Optical Cable (AOC Cable)? Bandwidth usage is soaring, driven by the proliferation of Internet-connected devices. At this time, active optical cable (AOC cable) has emerged. Besides, the market of AOC cables keeps growing and has a broad prospect. What’s active optical cables? Why should we use it? 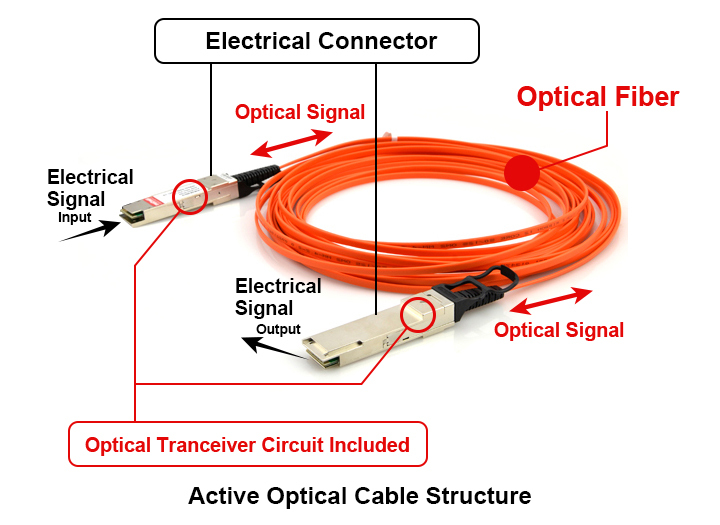 In this article, some knowledge of active optical cables will be provided. Active optical cable (AOC) is used for short-range multi-lane data communication and interconnect applications. Usually, the wire transmission of optical communication should belong to passive part, but AOC is an exception. AOC consist of multimode optical fiber, fiber optic transceivers, control chip and modules. It uses electrical-to-optical conversion on the cable ends to improve speed and distance performance of the cable without sacrificing compatibility with standard electrical interfaces. Since people expect more information to be available at their fingertips, our communications systems will need to be quicker, and AOC is one of the best solutions to solve this problem. Compared with direct attach copper cable for data transmission, AOC provides more advantages, such as lighter weight, high performance, low power consumption, low interconnection loss, EMI immunity and flexibility. 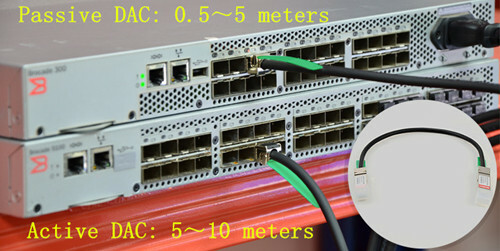 At present, AOC is widely used in many fields as well as promoting the traditional data center to step into optical interconnection. Passive cabling provides a direct electrical connection between corresponding cable ends. Active cables provide the same effect but, by embedding optics and/or electronics within the connectors, can overcome some of the limitations of passive cables. While passive cables are always copper-based, active cables can use either copper wire or fiber optics to provide the link between the cable ends. The picture below shows us the leading types of passive and active cables for data center. Why Use Active Optical Cable (AOC Cable)? Primarily, active optical cable (AOC) assemblies were invented to replace copper technology in data centers and high performance computing (HPC) applications. As we know, copper passive twinax cable is heavy and bulky, making it difficult to physically manage the datacenter. And due to the nature of electrical signals, electromagnetic interference (EMI) limits copper’s performance and reliability. Though there are so many disadvantages of copper cable, at that time, it is the main stream while the idea of AOC cables almost seems too good to be true. However, the advantages of AOC cables make the predecessors look obsolete and unsophisticated, and changes the limitation of copper passive twinax cable as well as playing an important role in high speed data transmission. 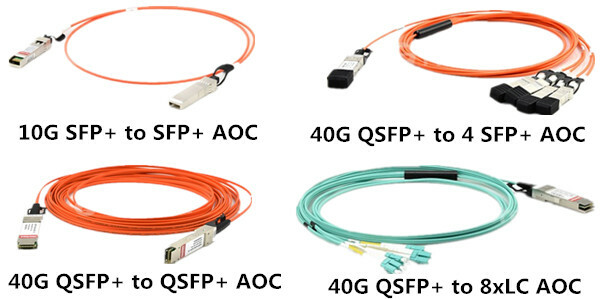 Nowadays, a variety of active optical cable have been launched in the market, such as 10G SFP+ AOCs, 40G QSFP+ to QSFP+ AOCs, 40G QSFP+ to 4 SFP+ breakout AOCs and ,40G QSFP+ to 8xLC breakout AOCs. FS.COM active optical cables achieve high data rates over long reaches which are the best solutions for high-performance computing and storage applications. We provide many AOC products such as 10G SFP+ AOCs, 40G QSFP+ AOCs, QSFP+ to 4 SFP+ AOCs, and QSFP+ to 8 x LC AOCs. In addition, customized active optical cables are available in various lengths, Cisco compatible and other options. For more detailed information, please visit www.fs.com or contact us over sales@fs.com. This entry was posted in QSFP+ Transceiver, Switch & Transceiver and tagged 10G SFP+ AOC, 40G QSFP+ to 4 SFP+ breakout AOC, 40G QSFP+ to 8xLC breakout AOC, 40G QSFP+ to QSFP+ AOC, Active optical cable, AOC, copper passive twinax cable on February 8, 2016 by Alice.Gui. What Is the Difference Between Singlemode QSFP+ and Multimode QSFP+? The singlemode and multimode QSFP+ here mean the transceivers which work at different types of optical fibers, ie singlemode type will work with singlemode fiber, while multimode one will work with multimode fiber. So, what’s the different between them? And what should we notice when using them? Which one should I choose? In this article, we will have a discussion around this topic. Singlemode fiber (SMF) has much tighter tolerances for optics used. The core is smaller and the laser wavelength is narrower. This means that SMF has the capability for higher bandwidth and much longer distances in transmission. Singlemode QSFP+ works mainly in 1310nm wavelength and is mostly used in long distances transmission. There are many different types of them, and different type can achieve different transmission distance, such as 500m, 1km, 2km, 10km and 40km. he color of compatible fiber optic patch cord is yellow. 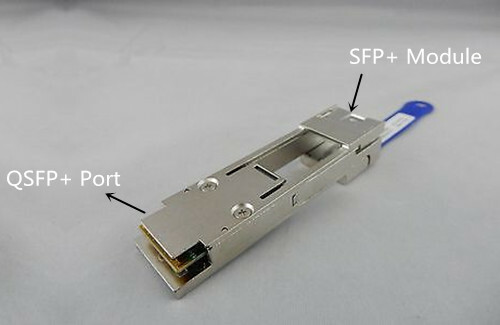 SMF QSFP+ usually uses duplex LC connector, but there also are some types use MPO/MTP connector. Multimode fiber (MMF) uses a much bigger core and usually uses a longer wavelength of light. Because of this, the optics used in MMF have a higher capability to gather light from the laser. In practical terms, this means the optics are cheaper. The common multimode QSFP+ works in 850nm wavelength and is only used for short distance transmission reaching 100m and 500m. Though it’s not able to transport for long distance, it can transport many kind of optical signals. It usually uses MPO/MTP connector, but some SMF&MMF ones can also use duplex LC connector. Choose a Singlemode or Multimode QSFP+? 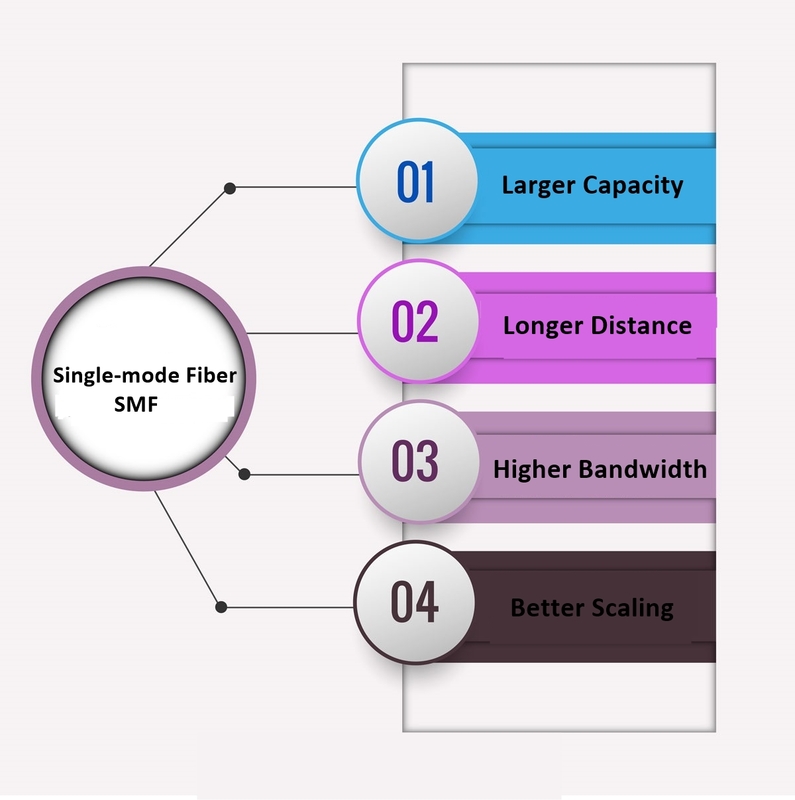 SMF and MMF QSFP+ may have different transmission distance and connectors, which is the most important factors you should consider when to make a decision. In the table below, I display the specifications of some main SMF and MMF 40G modules. Hope to help you to choose the right one for your network. Ensure that the transceiver in both ends of the fiber patch cord are of the same wavelength. A simple method is that the color of the modules must be consistent. In general, to ensure the data accuracy, short-wave QSFP+ modules use with multimode fibers (ie. aqua OM3 or OM4 fiber patch cord), while long-wave modules use with single-mode fiber (ie. yellow fiber patch cord). Do not over bend or winding fiber optic cables when using them. This will increase the attenuation of light in transit. If you don’t use this module, you must use the dust plug to protect the optical bore. When we choosing the QSFP module, we must confirm the transmission distance and wavelength we want to use in. This will help us to choose the right QSFP modules more efficiently. In addition, the costs for transceiver modules which keep adding up over time will be a budget pressure for many users. To save more, we can choose the compatible module without sacrificing any quality or reliability but only with a low cost. Fiberstore, an excellent supplier, supplies 100% compatible fiber optic transceiver modules of many brands, such as Cisco, HP, Juniper, Brocade, Finisar etc. with a incredible discount that may be a good choice for you. This entry was posted in QSFP+ Transceiver and tagged FTL4C1QL1C, FTL4P1QL1C, JNP-QSFP-40G-LX4, Multimode QSFP+, QSFP-40G-CSR4, QSFP-40G-LR4, QSFP-40G-PLRL4, QSFP-40G-SR4, QSFP-40G-UNIV, Singlemode QSFP+ on February 4, 2016 by Alice.Gui. High speed and wide bandwidth demands drive data centers to consolidate into more complex systems. The speed of data center now is increasing to 40G and eventually to 100G. How to achieve 40G connectivity? In fact, we need some new optical technologies and cabling infrastructure. In this post, I will introduce some commonly used qsfp and qsfp cable for 40G connectivity. As we know, fiber optic transceiver is an electronic device that receives an electrical signal, converts it into a light signal, and launches the signal into a fiber. It also receives the light signal, from another transceiver, and converts it into an electrical signal. It is the key component in fiber optic transmission. The basic interface of 40G pluggable optical modules are 40GBASE-LR4 and 40GBASE-SR4 in QSFP+ form factor. 40GBASE-SR4 transceivers are used in data centers to interconnect two Ethernet switches with 8 fiber parallel multimode fiber OM3/OM4 cables. It can support the transmission distance up to 100 m with OM3 fiber and 150 m with OM4 fiber. The optical interface of 40GBASE-SR4 is MPO/MTP. 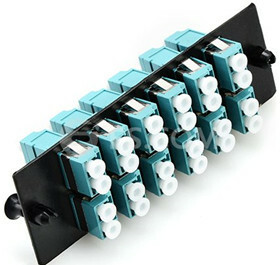 This module can be used for native 40G optical links or in a 4x10G mode with parallel to duplex fiber breakout cables for connectivity to four 10GBASE-SR interfaces. 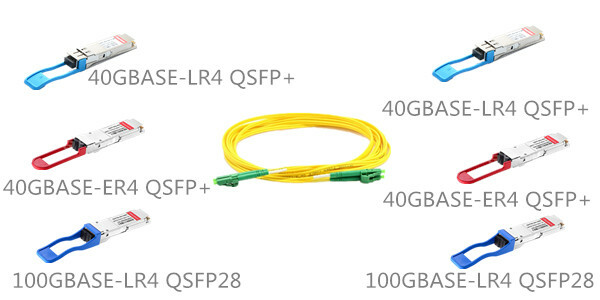 40GBASE-LR4 QSFP+ transceiver support with a link length up to 10 kilometers over 1310 nm single-mode fiber with duplex LC connectors. The 40 Gigabit Ethernet signal is carried over four wavelengths. Multiplexing and demultiplexing of the four wavelengths are managed within the device. It is most commonly deployed between data-center or IXP sites with single-mode fiber. QSFP+ cable is designed to meet emerging data center and high performance computing application needs for a short distance and high density cabling interconnect system capable of delivering an aggregate data bandwidth of 40Gb/s. QSFP+ cables are suitable for very short distances and offer a highly cost-effective way to establish a 40G link between two switches within racks and across adjacent racks. These high speed cables provide a highly cost-effective way to upgrade from 10G to 40G or 40G to 40G interconnect connection. The 40g passive or active direct attach copper cables (DAC) are designed with twinax copper cable and terminated with QSFP+ connectors. The main difference between passive DAC and active DAC is that the passive one is without the active component. Therefore, active QSFP+ DAC can achieve a longer transmission distances than passive QSFP+ cable. Active optical cable, namely AOC brings a more flexible cabling than direct attach copper cables with the advantages of lighter weigth, longer transmission distance and higher performance for anti-EMI. Now, 40G AOC cable are popular with users. Since 40GBASE-SR4 and 40GBASE-CSR4 both use MPO/MTP connector. 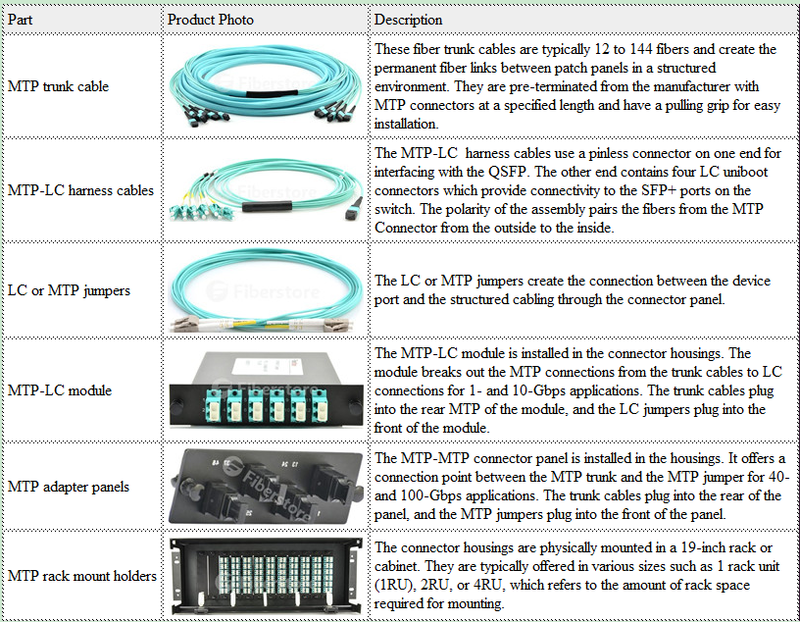 Therefore, in addition to fiber optic transceivers and direct attach cables, MTP cabling series usually needed to achieve 40G connectivity. This series include MTP trunk cables, MTP-LC harness/breakout cables, LC or MTP patch cables, MTP-LC cassette modules, MTP adapter panels and MTP rack mount holders. Fiberstore offers a comprehensive solution for 40G network connectivity. What’s more, products such as 40GBASE-LR4 and 40GBASE-SR4 modules are in stock and can shipped in 12hrs. For more information, please visit www.fs.com. This entry was posted in QSFP+ Transceiver and tagged 40G Connectivity, 40G QSFP+, 40GBASE-LR4 QSFP+, 40GBASE-SR4 QSFP+, Active optical cable, MTP trunk cable, MTP-LC harness cable, QSFP+ Direct Attach Cables on January 30, 2016 by Alice.Gui. As we all know, 40GBASE-SR4 QSFP+ transceivers usually use a parallel multimode fiber (MMF) link to achieve 40G. It offers 4 independent transmit and receive channels, each capable of 10G operation for an aggregate data rate of 40G over 100 meters of OM3 MMF or 150 meters of OM4 MMF. 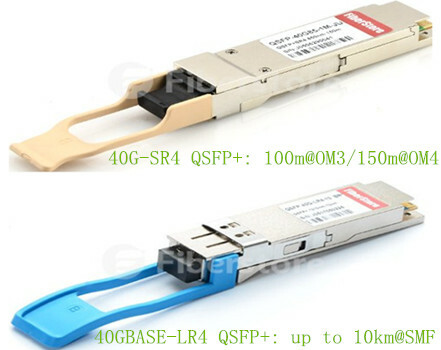 However, for 40GBASE-LR4 QSFP+ transceivers, there are two kinds of links. One is coarse wavelength division multiplexing (CWDM) and the other is parallel single-mode fiber (PSM). What’s the difference between them? In this article, I will show their working principles to you respectively. The 40GBASE-LR4 CWDM QSFP+ transceiver, such as QSFP-40GE-LR4, is compliant to 40GBASE-LR4 of the IEEE P802.3ba standard. It contains a duplex LC connector for the optical interface. The maximum transmission distance of this transceiver is 10km. To minimize the optical dispersion in the long-haul system, single-mode fiber (SMF) has to be used. This transceiver converts 4 inputs channels of 10G electrical data to 4 CWDM optical signals by a driven 4-wavelength distributed feedback (DFB) laser array, and then multiplexes them into a single channel for 40G optical transmission, propagating out of the transmitter module from the SMF. Reversely, the receiver module accepts the 40G CWDM optical signals input, and demultiplexes it into 4 individual 10G channels with different wavelengths. The central wavelengths of the 4 CWDM channels are 1271, 1291, 1311 and 1331 nm as members of the CWDM wavelength grid defined in ITU-T G694.2. Each wavelength channel is collected by a discrete photo diode and output as electric data after being amplified by a transimpedance amplifier (TIA). Unlike CWDM QSFP+ transceiver which uses a LC connector, PSM QSFP+ is a parallel single-mode optical transceiver with an MTP/MPO fiber ribbon connector. It also offers 4 independent transmit and receive channels, each capable of 10G operation for an aggregate data rate of 40G on 10km of single-mode fiber. Proper alignment is ensured by the guide pins inside the receptacle. The cable usually cannot be twisted for proper channel to channel alignment. In terms of a PSM QSFP+, the transmitter module accepts electrical input signals compatible with common mode logic (CML) levels. All input data signals are differential and internally terminated. The receiver module converts parallel optical input signals via a photo detector array into parallel electrical output signals. The receiver module outputs electrical signals are also voltage compatible with CML levels. All data signals are differential and support a data rates up to 10.3G per channel. 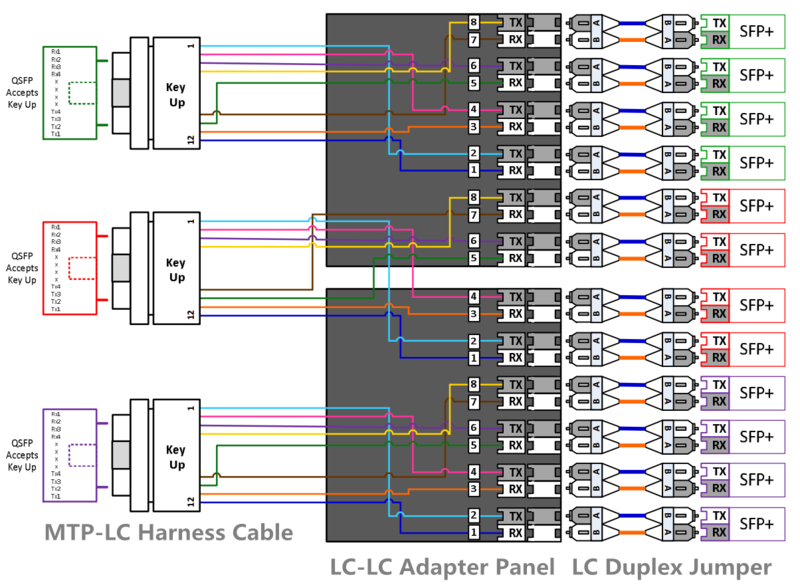 In addition, the caveat is that the entire optical fiber infrastructure within a data center, including patch panels, has to be changed to accommodate MTP connectors and ribbon cables, which are more expensive than conventional LC connectors and regular SMF cables. What’s more, cleaning MTP connectors is not a straightforward task. Therefore, CWDM is a more profitable and popular 40G QSFP link. For 40GBASE-LR4 QSFP+ transceivers, either CWDM link or PSM link, the maximum transmission distance is both 10km. 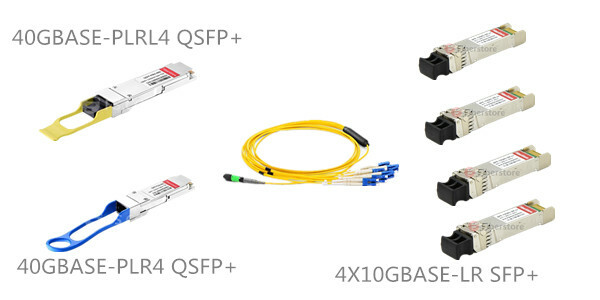 40GBASE-LR4 CWDM QSFP+ transceivers use a duplex LC connector via 2 optical single-mode fibers to achieve 40G. 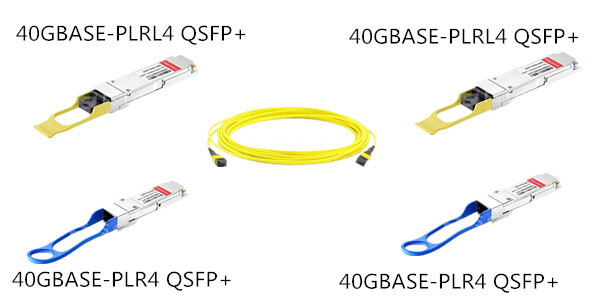 However, 40GBASE-LR4 PSM QSFP+ transceivers use an MTP/MPO fiber ribbon connector via 8 optical single-mode fibers to reach 40G. 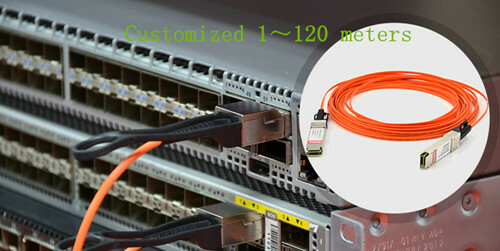 Therefore, CWDM QSFP+ enables data center operators to upgrade to 40G connectivity without making any changes to the previous 10G fiber cable plant, which is more cost-effective and widely used by people. 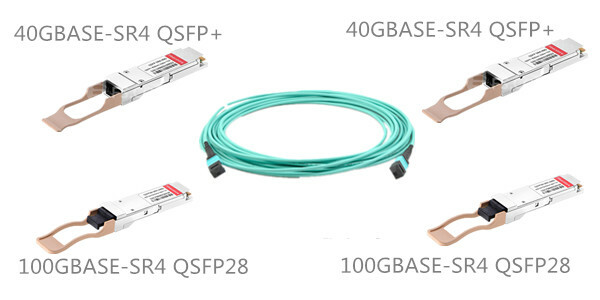 Fiberstore provides wide brand compatible 40G CWDM QSFP+ transceivers, such as Juniper compatible JNP-QSFP-40G-LR4 and HP compatible JG661A. In Fiberstore, each fiber optic transceiver has been tested to ensure its compatibility and interoperability. Please rest assured to buy. For more information or quotation, please contact us via sales@fs.com. This entry was posted in QSFP+ Transceiver and tagged 40G QSFP+, 40GBASE-SR4 QSFP+, CWDM, JG661A, JNP-QSFP-40G-LR4, PSM, QSFP Transceiver, QSFP-40G-LR4, QSFP+ on January 15, 2016 by Alice.Gui.